Perfect for shooters and nearly flawless for everything else, the Corsair M65 RGB Elite is one of the best gaming mice out there. When we go out to buy a gaming mouse, we usually measure aesthetics, performance and value equally. On the rare occasion that a gaming mouse manages to hit the nail on the head in all three categories, it really is cause for celebration. The Corsair M65 RGB Elite, then, should be celebrated for years to come. At $59 (£59, about AU$80), the Corsair M65 RGB Elite costs about the same as a new AAA game, and with all the features, performance and the attractive RGB lighting, it’s going to be one of the best gaming mice you can buy period. It’s a bit lighter than we like, but that’ll ultimately boil down to personal preference, and it didn’t sour the overall experience. While we got sent the white Corsair M65 RGB Elite, you can pick it up in black too, if that’s more your aesthetic. And, usually we would go for a black color option, as we don’t like how dirty white peripherals can get. At least, that’s the way we thought before we got our hands on this mouse. It’s absolutely gorgeous, the white chassis perfectly complements the gray side panels and mouse wheel. And, the way that the RGB shines through the slots in the back of the mouse, creating a lighting pattern beneath it. Seriously, this is some next-level mouse design and it impressive how modern it feels despite largely sticking to the same look as the original M65 RGB, released in September 2014. There are two zones of RGB illumination, controllable by Corsair’s proprietary iCue software, love it or hate it. We happen to be fans of the freedom it gives you, but there are plenty of people that would prefer something more simple like Razer’s Synapse software. The mouse also feels great in-hand. Now, we get that this will be subjective, as everyone has different sized hands, but the Corsair M65 RGB Elite felt great in our hands, though if you have larger hands, your mileage may vary. However, it is extremely lightweight – even with all the removable weights installed it maxes out at only 115 grams. So users that prefer a more heavyweight mouse might take some adjustment. Speaking of the weights, there are three of them, and they’re not quite as easy to remove as other tunable gaming mice. Where you’d usually be able to just pop out the weights on other mice, there are three large covers you have to unscrew and remove to access the weights. And, even after removing these screws, it might take a good shake for them to actually drop out – one came out really easily, but we actually had to get a pen to pry out the other two. However, this is likely just due to it being new, and they’ll loosen up over time. However, if you want a mouse that’s light as a feather, getting these fussy weights out can bring the weight down to a measly 97g. Or, you can just remove a few of them to change the center of gravity. The Corsair M65 RGB Elite thankfully takes it easy when it comes to the amount of buttons included, keeping it down to a manageable eight, including a sniper button on the left hand side of the mouse, below the back and forward buttons. The buttons themselves are packing Omron switches, which are tactile and responsive and rated for a lifespan of 50 million clicks. 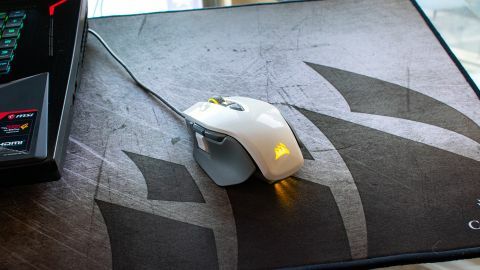 This reviewer has never played with a mouse with a dedicated sniper button before, and we have to say it was a revelation. This button completely changed the way we played Battlefield V, improving our aim significantly. No matter how pretty a gaming mouse might be, it doesn’t mean much if it can’t perform well. And, we’re happy to report that the Corsair M65 RGB Elite is an absolute beast of a gaming mouse. The sensor on the Corsair M65 RGB Elite is rated at 18,000 DPI, and through the iCue software you can adjust it in 1 DPI steps, meaning you can dial in the mouse’s sensitivity to a level that’s perfect for you. We already mentioned the buttons in the previous segment, but they’re incredibly responsive, eliminating any lag between clicks and in-game actions. We tested the Corsair M65 RGB Elite in Battlefield V, with a bit of time spent in Monster Hunter World, when we were too tired from Christmas dinner to find our controller. In both games, the M65 RGB Elite absolutely shined, the sensor picked up all of our movements perfectly – with that dedicated sniper button helping us pull off some shots that we really shouldn’t have been capable of. We’re having trouble thinking of a single moment in the week we spent with this mouse where we noticed a single problem with the mouse’s performance. If you’re looking for a fantastic gaming mouse that won’t break the bank, it’s hard to think of something better than the Corsair M65 RGB Elite. We would have liked the ability to make it a bit heavier, but the more lightweight design was easy to get used to. This mouse, with its 18,000 DPI sensor, dedicated sniper button and reliable Omron switches makes it an easy recommendation for any shooter fans out there. And, with the customizable RGB lighting and absolutely gorgeous design, it’s easy to see why this is one of the best gaming mice on the market.